The West Bay Clubs closest beach is Colwell Bay and only a short 5 minutes drive away, actually it seemed most beaches were only a short drive away. The Isle of Wight is only about 30 miles across which means no long car journeys trying to keep the kids entertained no matter where you decide to visit. It wasn't exactly bikini and trunks weather but it was dry and bright so we wrapped up warm, put our wellies on and walked along the sandy shores which was lovely. Along the beach were sweet colourful beach huts and a cute little cafe called The Hut. 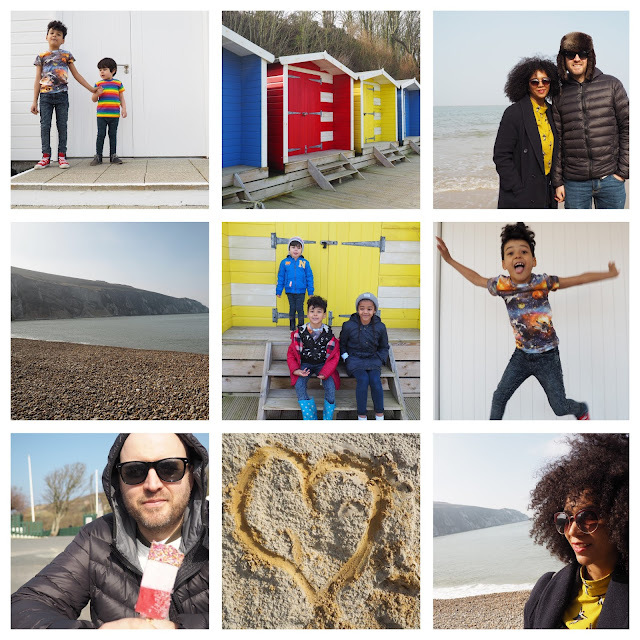 We didn't stop at Colwell Bay for long as I was desperate to see The Needles and The Littles were excited to ride the Chair Lifts down to the coloured sands. Unfortunate when we arrived at The Needles the Chair Lifts were closed (opening the following week) but having talked to the locals the Chair Lifts are a really great experience. So I would love to return and try them out for myself. At The Needles there was a small amusement park, Carousel, Zorbs, Crazy Golf, a few small rides, mini museums, enough to keep the kids busy for a few hours. The Needles is also famous for the multi coloured sands which I really wanted to see. You can normally get down to the sands by the Chair Lifts which sounded amazing. The walk down to the multi coloured sands was about 180 steps, the steps are sturdy and weren't particularly steep, on a normal day even Beaux would have been okay to climb them but he was a little unwell and understandably The Mister didn't fancy carrying him. So while they all went for a round of Jurassic Crazy Golf I went off to see the coloured sands. The walk down the 180 steps was pretty easy, in fact I saw a woman who must have been about 70 years old do it after me. The walk back up was a little harder and I may have strategically stopped 'to take a few photos' and some deep breaths but overall it was fine. I don't know if it's me being a bit dim but I thought the coloured sands would be the sand on the shore, I had visions of walking along bright pink sand but in fact it's the rocks which are colourful. It's still pretty amazing, the colours are gorgeous Pinks, Oranges, Reds, Purples and unlike anything I've ever seen in my life! You can also get a great view of The Needles and the beach itself is a sun trap. I wished The Mister and The Littles had come with me as they would have loved it and I was quite enjoying feeling the sun on my skin. Overall our time on the Isle of Wight was lovely. We loved staying at The West Bay Country Club, in fact Tiger suggested we go home, collect our belongings and move in! The Wighlink Ferry was easy, stress free and quick, providing you are relatively close to Portsmouth you could easily visit for the day if you wanted to. We only spent a weekend here but we will definitely be returning for a longer holiday. The beaches we saw were lovely, The Needles made a great family day out and I loved that all the beaches and attractions are really close by. A great place for a family holiday.